The best supporting actress category is quite a difficult one to decide this soon after the announcement of the nominations. Usually the Golden Globes and the SAG awards set the path for the Oscar. This year it could be anyone’s guess. When acting in a Quentin Tarantino movie, the possibility of garnering an Academy Award nomination is not out of the ordinary. For Jennifer Jason Leigh her role as the arrogant and sarcastic bounty on her way to be hanged, is no doubt one of the highlights of her career as it brought her the first Oscar nomination in her long career. It’s the kind of character and role that Tarantino loves to create and almost always casts perfectly. Leigh is not exactly the front runner, but is by no means the dark horse in this tight race. Don’t be shocked if she walks away with gold. This is the second nomination for Rooney Mara and it is a drastically different role from her first nomination in The Girl With The Dragon Tattoo. Mara plays the shy and self conscious Therese Belivet opposite fellow nominee, Cate Blanchett. The story of a young girl falling in love and having an affair with an older, married woman, has produced much praise and quite a few nominations. Mara one of the top three in this category that are the closest choices. Rachel McAdams is one of those stars that really has the great ability to balance between good money making films and is also willing to take on challenging roles. Her roles range from Wedding Crashers and Mean Girls to Woody Allen’s Midnight In Paris and A Most Wanted Man. She has done her best to continue in her diversity and not settle into the easy money and finding her face on billboards all over town. Her portrayal of Boston Globe reporter Sacha Pfeiffer is one of the roles where she isn’t front and center. Her interpretation shows the work ethic and unstoppable ability to find the truth for not only journalistic integrity, but for the quest to find the truth. McAdams is more of a long shot here as evidenced by her somewhat surprising nomination. If Spotlight is going to have a big night it could all start with her. Alicia Vikander has been one of the biggest breakout stars of the year with the highly praised sleeper hit, Ex-Machina and of course her nominated role as Gerda Wegener in The Danish Girl opposite fellow nominee, Eddie Redmayne. She is primed to be one of Hollywoods brightest young stars and this could be how it starts, much like it did with Jennifer Lawrence when she was an unknown when she received her first nomination for Winters Bone. Vikander is closer to McAdams in this category when it comes to her odds (again, much like Lawrence’s unlikely first win). Kate Winslet is quickly becoming the next Meryl Streep with now having her seventh nomination in twenty years. This is her first nomination since she won for her extraordinary performance in The Reader seven years ago. This time around, she is playing Steve Jobs long time assistant, Joanna Hoffman in Danny Boyle’s biopic Steve Jobs. The great thing about her performance is that, not only is she up to the task spitting out the insane amount of dialogue writer Aaron Sorkin loads in his films, but she does so with a perfect yet very subtle polish accent. Her accent is not one that fades in and out, but is clearly true of someone highly educated in English speaking schools and who has spent quite a bit of time in America. She delivers what we have come to expect from her so well she can’t be ignored and is the very early favorite in this category as was evidenced by her win at the Golden Globes which even took her by surprise. So, no hard predictions yet, but a brief look at the first of eight major categories I will take examine before laying out my final ballot. As one of the most unique and innovative screenwriters currently working in Hollywood, Charlie Kaufman can carefully and superbly craft a story in a way unlike any other. One of his most relatable and best written films was with 2004’s, Eternal Sunshine Of The Spotless Mind. Charlie Kaufman gained notarially with his brilliant script for Being John Malkovich which fused one of Hollywood’s most innovative writers with one of Hollywood’s most eccentric people. The film would go on to be a massive independent hit and bring Kaufman an Oscar nomination. The trouble with “Malkovich” is people just didn’t get it. It would take 5 more years and an upstart production company in Focus Features to help people see that Kaufman wasn’t crazy but just had a detailed deep and different way of looking at everyday life that involved a lot of creativity. Charlie Kaufman would have 2 Oscar nominations under his belt by the time Eternal Sunshine would begin it’s production. one for “Malkovich” and one for Adaptation which did bring Oscar gold home for Chris Cooper in his best supporting actor role. Eternal Sunshine is the story of a man named Joel Barish who has recently broken up with his eccentric girlfriend, Clementine. He soon discovers Clementine has enlisted the help of the Lacuna corporation to aid her in erasing Joel from her life and memory. Fueled by his disappointment and anger, Joel then decides to have the same procedure done. It is only at the start and under sedation that he realizes that he doesn’t want Clementine erased from his mind. He wants to keep all the memories, good and bad. The movie then is a trip through the relationship of Joel and Clementine as seen through the eyes of Joel’s memory and their attempt to stay together even if it’s in Joel’s mind. With a look at relationships and areas of life that most people have felt and have memories they wish they could just all together forget, Eternal Sunshine shows that life is what it is and makes us who we are despite the great and terrible moments we endure. Eternal Sunshine would go on to be the movie that would force those in the independent world to take notice of Michel Gondry. It was his American directorial debut and some films to follow would not live up to Eternal Sunshine but would none the less have Gondry’s touch on them all. Kaufman however would continue to make some of Hollywood’s most unique and intelligent films which included his debut as a director with Synecdoche, New York starring Philip Seymour Hoffman. Synecdoche would not bring in the viewers that Eternal Sunshine did but would let Kaufman really stretch himself as a screenwriter and director. Jim Carrey and Kate Winslet turned in superb performances which would have made the film mediocre or even bad without such acting. With what, off screen, seemed like such an unlikely chemistry, Carrey and Winslet proved they had what it takes to make it work. Winslet was already on her way to being the greatest working actress since Meryl Streep (which she has surpassed in the eyes of this reviewer) . Carrey would once again get snubbed like he did in ’98 and ’99. Regardless of awards and recognitions, Eternal Sunshine is a great and different slant on the modern day love story that will leave you thinking and then wanting to re-live it all over again. One of my favorite performances of all time was Elizabeth Taylor in “Who’s Afraid Of Virginia Woolf?” Taylor’s role is that of Martha, the alcoholic wife who is unhappy the path her life has taken and where she is in her life and marriage. When a young couple comes to their home for the evening and Virginia begins drinking all hell breaks loose and everyone’s true thoughts become well known. It’s a dramatic powerhouse of acting and a sharp script that has truly stood the test of time. Roman Polanski’s latest film has a very similar feel to Virginia Woolf in which two couples come together to discuss a recent physical altercation between their eleven year old sons. As the afternoon goes on tension rises between the couples and amongst the married couples themselves. Carnage being the title of the film undoubtedly describes what ensues of the course of the afternoon while the two couples attempt to resolve whatever issues there are between the boys. The disagreements between parenting styles and personal life create a hot bed of personality clashes. Polanski has masterfully crafted a film that could easily toe the line between comedy and drama that the subject matter so easily created. 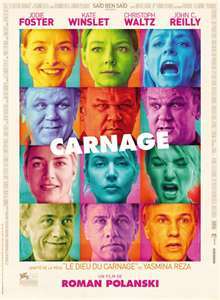 While Virginia Woolf took the dramatic side of the situation, Carnage no doubt takes the comedic side and with a biting humor that has you shocked that you are laughing. With a cast of only 4 the film is still superbly acted and casted. John C. Reilly plays the husband of Jody Foster and tries to be the peacemaker of any awkward situation that is on the horizon. Jody Foster is nervously trying to handle the situation professionally as tho this is a business transaction. Christoph Waltz who plays the Husband of Kate Winslet is the disinterested Attorney who’s mind is always at the office while his wife, Winslet, is just trying to make sense of why the situation amongst the boys presented itself and how to prevent it from happening again. With all four actors masterfully delivering a plethora of dialogue and running the gamut of emotions all with such intelligent wit that falls into near slapstick humor when the bottle of eighteen year old scotch gets opened and all start dabbling and everyones true feelings begin pouring out. Much like the very uncomfortable feeling Virginia Woolf gave off the same feelings are felt in Carnage but are relieved when you can’t help but let laughter out at some of the off the wall thinking and comments that are then made. Polanski has weaved a fine film with such minimal elements and relied heavily on the smart script and the intelligence that the audience posses to make a fine film that will leave you wanting more and ultimately make you feel a little bit sorry for the kids that have to deal with parents like these. These are parents so obsessed with making such a perfect life that they have found themselves at the polar opposite of such a life. While the film is very short on time being only 79 minutes long, there is so much packed in the short time you don’t feel short changed by any means. John C. Reilly didn’t get the accolades that Foster and Winslet received but he has proven to be one of the great comedic actors working. Whether or not Reilly is being off the wall silly with his good friend Will Ferrel or whether he is being intelligent and tickling your mind in Carnage he has truly made an art form of comedic acting and this film is no different. It’s a film well worth your time if you are looking for a laugh but don’t want to be treated like your comedic intelligence is so low that only the lowest humor will do. Be prepared for a smart comedy that doesn’t leave you feeling dumber for having just watched but will still leave you laughing after it’s over.